First official count day of the season. It was a pretty decent day to start the season off. It was clear and cold, much of the morning was below freezing, and the wind was coming from the East-Southeast. There was a movement of Sandhill Cranes totaling 2,052. Raptors included Turkey Vulture, Bald Eagle, Red-shouldered & Red-tailed Hawks, & American Kestrel. A flock … Continue reading First official count day of the season. With heavy heat and humidity, things are far different than when things started in March. However, in March we were happy to see Pine Siskins migrating. Some three months later, they're still moving. 99 seen yesterday! 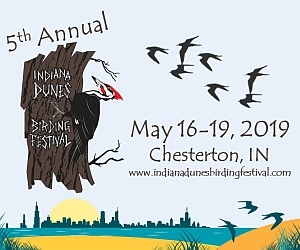 As we enter into Memorial Day Weekend, remember... bird migration is still happening! Here is yesterday's complete list of … Continue reading Pine Siskins never end! Well it's been a quiet week at Lake Michigan, Indiana, our hometown, out on the edge of the migration. Things got a little colder here this last week. While Sunday and Monday brought a mini heat wave and the pulse of migrants, a strong north wind clipper quickly shut off that valve Tuesday morning. Fortunately … Continue reading Stand Still- rarities coming!